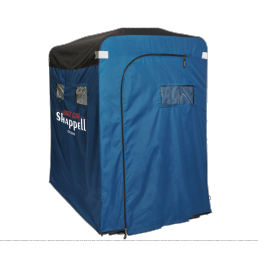 This two to three person cabin shelter is constructed with an extreme-duty 600D polyester shell with two zippered doors and six removable windows with shades. The floor of the high density sled base is covered in marine-grade carpeting and the steel frame is shock corded. Pop-up skis are included for easy mobility in snow conditions.